The theme for November’s photo blogging challenge hosted by http://hoohaa.com/ was Nom Nom Nom. It seems like it has been forever since I participated in the photo challenge. I wanted to get back into doing this and when the theme is FOOD, I had to go through my pictures and share. Without further ado, here are my pictures on the theme. The standard Belize meal is stewed chicken, rice and beans, and Cole slaw. 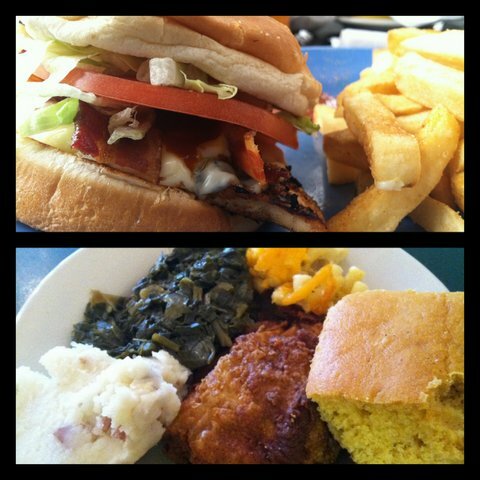 When I don’t know what to order, it is my comfort food!!! Pina coladas were my Nana’s favorite drink. As she got older, she would ask for them without the rum. I would tell the server to put the rum on the side 😂 . The local beer in Belize is Belikin . Hubs drank that while I was drinking piña coladas. When we were in Atlanta for a trade show, we went to an Irish pub. They had fried goat cheese and it was delicious!! It had a side of honey with jalapeños. It was sweet, salty, and spicy all at the same time. These were just a few of the pictures that show how much delicious food I ate during the month. 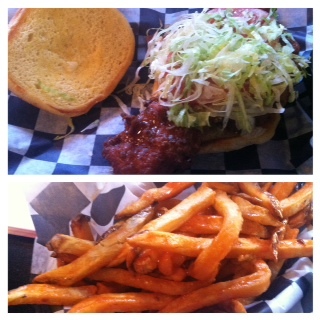 Until last October, every time I went to TW Boons , I ordered the same thing: Roadrunner with fries (see top photo). It is basically a chicken sandwich with bacon, cheese, and honey mustard sauce. I used to get the chicken fried, but once I started trying to lower my calorie intake, I ordered it blackened. I love the seasoning mixture they put on the chicken when they put it on the grill. The fries are standard with a dash of season salt. Since they can be skimpy on the salt, I ask them to add extra. Even though I have been to TW Boons several times in the last few months, I have not ordered my standby sandwich. They installed a hot bar! I am not usually one for eating bar food. I detest Ryans / Quincy’s and many of the chain all-you-can-eat places. But TW Boons’ hot bar is so different. I think that reason #4 is the best reason of all. I don’t have a picture of my dessert but try to imagine this: Fried sweet pastry with a cheesecake filling with a light dusting of cinnamon and powdered sugar. My goal was to lower my calorie intake, but I am eating fried chicken and dessert now. Oh the irony! I went to Buffalo Grill a second time with some people from work. 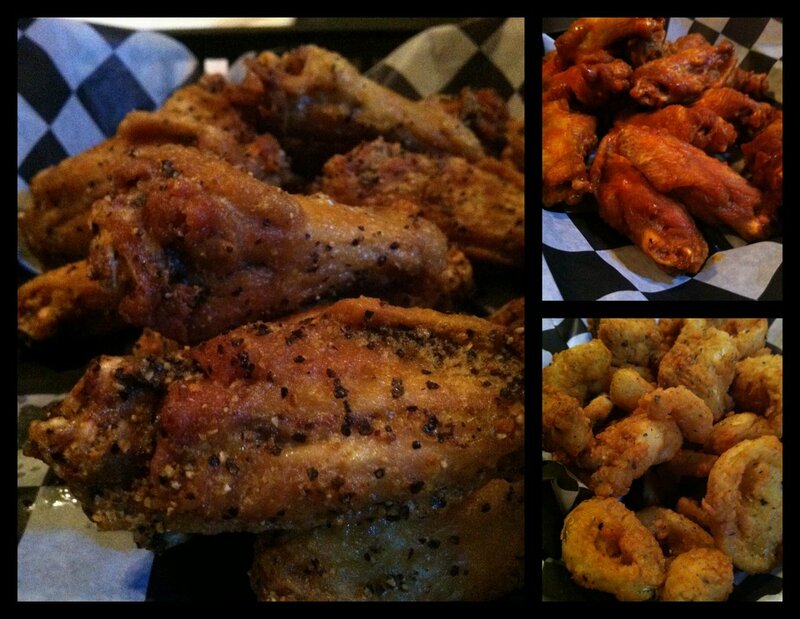 This time, we got wings and appetizers. Home run out of the park! We ordered the lemon pepper and classic buffalo hot flavors. I think lemon pepper is my new favorite. The citrusy flavor coupled with the pepper salt seasoning was on point. Is the picture making your mouth water yet? The wings were fried enough so that the skin was crispy without being overly greasy. Their buffalo hot sauce was not too spicy for me, but I think others might find it has heat. We also ordered fried banana peppers. Every time I looked at it, I would think calamari. The batter was light and adhered to the peppers well. These were not spicy at all. There was a slight vinegary taste which led me to believe these banana peppers were probably pickled. The flavor was good but I don’t think I could eat a whole serving of these since they are not very filling. Good thing I had some buffalo fries on the side. This was not the most healthy meal I ever had, but it was quite tasty! Last summer Buffalo Grill opened. They serve wings, burgers, chicken sandwiches and fries. It took me a while to go because I heard they were pricey. Plus, I have another spot that I go and was not interested in trying the competition. That being said, my friend suggested Buffalo Grill and I decided I did not have a better suggestion and we went. With regards to the cost of the sandwiches, it was not as expensive as I thought. You can expect to pay $7-10 for the sandwiches without fries. Fries are about $3 but the serving sizes are big enough to feed 2 people (maybe even 3 depending on how hungry everyone is). I ordered the buffalo chicken sandwich and it was a big fried piece of meat generously doused in buffalo sauce. The flavor was good and "hot" was not too spicy. And the "buffalo fries" were covered in the same buffalo sauce. A simple concept but I was wondering why no one else has thought of it! The atmosphere and feel of the restaurant was what I expected. It has an open layout with televisions tuned to the sport’s networks. Servers greeted us with a smile as soon as we walked it. It did take considerable time for us to get our food. That is because they make everything to order. I only mention that because if you are going there for lunch, be prepared to get back to work a little late. Other than that, it was a good meal and I will be back. 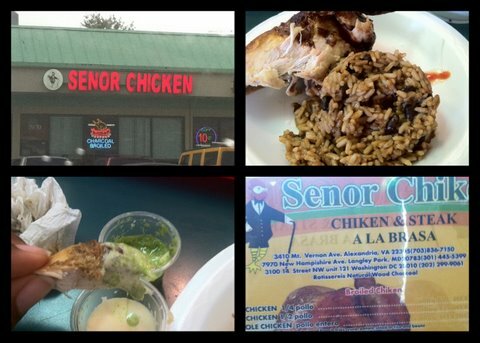 Senor Chicken was located in a little strip mall in Langley Park VA. I was hungry and wanted something other than McDonalds or Taco Bell. I found this place while shopping. Incidentally, I saw a lot of restaurants that said they served “Peruvian style chicken” and “Pollo a la brasa” (broiled chicken usually over fire). Of course you know that my mouth was watering at this point. effort that was put into preparing it. The reason for the restaurant, the main course, the CHICKEN was delicious! Each piece, regardless if it was white or dark meat, was juicy. The seasoning permeated all parts of the chicken. It even seems as if the bones were seasoned well. It was not overly salty or spicy. think other customers would have agreed with me. Overall: The chicken was scrumptious. IF can restrain yourself from eating a whole chicken and you are fortunate enough to have leftovers, the chicken does not lose flavor when it is reheated.